figure 14-10 Pathways and anatomical compartmentalization of the production of the C-18 estrogens (estradiol, estrone, estriol, and estetrol) in the human fetal placenta unit. This figure was derived from Buster, J. E., and Marshall, J. R. (1979). Conception, gamete and ovum transport, implantation, fetal placental hormones, hormonal preparation for parturition and partition control. In "Endocrinology" (L. J. DeGroot, G. F. Cahill, L. Martini, D. H. Nelson, W. D. Odell, J. T. Potts, Jr., E. Steinberger, and A. I. Winegrad, eds. ), Vol. 3, pp. 1595-1612. Grune & Stratton, New York. 60 ng/ml at weeks 6-36 of gestation. Up to the first 8-12 weeks of gestation the maternal ovary is the principal site of 17a-hydroxyprogesterone. After the first trimester, the placenta uses the precursor 17-hydroxy-A5-pregnenolone produced from A5 C-21 sul-foconjugates in the fetal adrenal cortex to produce 17-hy dr oxyprogesterone. 16a-Hydroxyprogesterone plasma levels gradually rise from 0.5 ng/ml at conception to a level of 120140 ng/ml by 32 weeks of gestation. 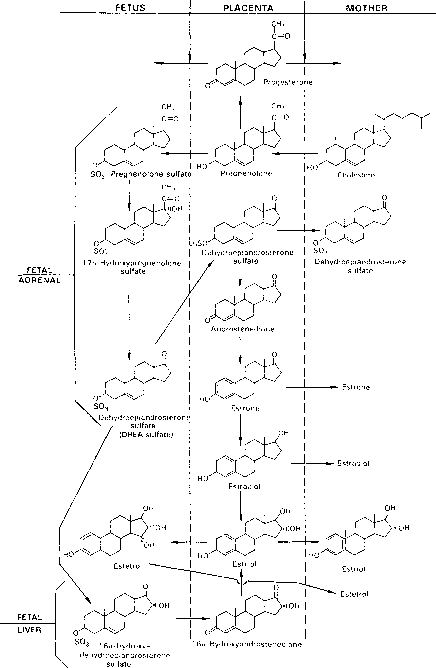 The precise bio-synthetic pathway of 16a-hydroxyprogesterone is not known; it is believed that the fetal liver produces 16-hydroxy-A5-pregnenolone sulfate and that this is converted by the placenta into 16a-hydroxyprogesterone, which is then available to both mother and fetus. There is no known specific biological response attributable to 16a-hydroxyprogesterone. Throughout the course of pregnancy there are four principal forms of the C-18 estrogens present. At parturition the relative serum concentrations are as follows: estradiol, 10-30 ng/ml; estriol 5-10 ng/ml; estrone, 5-8 ng/ml; and estetrol, 2-4 ng/ml. Estetrol is 15, 16-dihydroxyestradiol. Figure 14-10 summarizes their pathways of biosynthesis. Since the fetus plays a key role in the production of estetrol and estriol, the measurement of the maternal blood levels of these steroids has been proposed to provide some insight into fetal well-being. Thus, deteriorating fetoplacental health in the third trimester is often associated with falling unconjugated maternal serum estriol or estetrol concentrations.